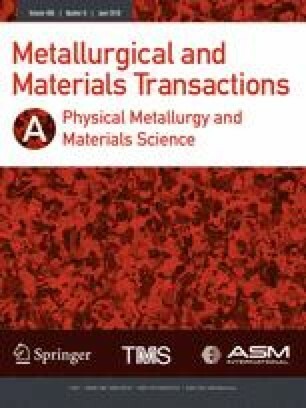 This work studied the formation of the α″ martensite and amorphous phases of TiNbTaZr alloy incorporated with TiO2 particles during friction stir processing. Formation of the amorphous phase in the top surface mainly results from the dissolution of oxygen, rearrangement of the lattice structure, and dislocations. High-stress stemming caused by dislocations and high-stress concentrations at crystal–amorphous interfaces promote the formation of α″ martensite. Meanwhile, an α″ martensitic transformation is hindered by oxygen diffusion from TiO2 to the matrix, thereby increasing resistance to shear. Ruoshi Ran and Yiwei Liu contributed equally to this article. Manuscript submitted November 29, 2017. The authors would like to acknowledge the financial support provided by National Science Foundation under Grant Nos. 51302168, 51674167, 973 Program under Grant No. 2014CB046701, Medical Engineering Cross Research Foundation of Shanghai Jiao Tong University under Grant No. YG2017ZD06.